Jep’s looking after his much more important Junior who was born last week (congats), so Anthony steps in! While rookie master Jeppa is out this week looking after his newest junior, I’ll be casting an eye over our rookie options this week. Fear not though, Jeppa will be back soon! In a week where we really needed our rookies to stand up, unfortunately not many did. Sam Petrevski-Seton ($372,000 BE 38) led the way with a 93 for anyone who played him on field this week. This takes his 3 round average up to 81 now and with his BE at 38 he will still generate us more cash over the next few weeks. Aaron Black ($259,000 BE -4) also did more than enough again to hold his spot in Geelong’s side by creating space for Hawkins to move into while scoring 73 points himself. Up against Essendon this week where both Cam McCarthy and Shane Kersten just scored 79 and 88 respectively, he should be in for another decent score. Caleb Marchbank ($395,000 BE 43) and Andy Otten ($370,000 BE 28) just keep getting it done for us. With a score of 84 this week pushing Marchbank’s BE to 43 and Otten’s 79 taking his to 28 they’ll still probably be a few of the last rookies we move on this season as they’re paying dividends on the field. Blake Hardwick ($265,000 BE 6) is still decent value if you didn’t jump on him. With a BE of 6 he is tracking along nicely and I can’t see him losing his spot any time soon. If you’ve kept Jake Barrett ($279,000 BE 0) all this time then you’d have been happy with his 69 points this week. Adding another $38K to his price tag and still at a negative BE for more cash generation. Our only concern with Barrett is his disposal under pressure doesn’t seem to be improving. With a few Lion cubs still waiting in the wings for games, let’s hope he can keep his spot. James Parsons ($219,000 BE 16) offered so much promise this week. But like a lot of Geelong’s team he just forgot to show up against the Suns. His 27 points definitely would have hurt you if he was on your field but unfortunately it has also pushed his BE into the positives with a 16. Hold the faith that he’ll bounce back this week against Essendon but maybe keep him on the bench. David Myers ($199,000 BE 31) is possibly another example of VFL form not translating to the big stage. With 41 points in a week where we needed more, it not only hurt our fantasy score but also pushed his BE to 31. He’ll need a decent score this week to be a worthwhile cash cow. With past season averages of 80ish he certainly has the potential so lets just hope this was a case of needing a game to adjust to AFL speed. Harley Balic’s ($250,000 BE 8) 41 also would have hurt this week and has pushed him to a BE of 8. He still has a bit of cash to make but his rollercoaster scoring his making him difficult to justify a spot on the field. Take Curtly Hampton’s ($356,000 BE 67) money and run! At this point he has made you an extra $152K from when he started but with a BE of 67 and a lot less midfield time these last two weeks it looks like he’ll struggle to make it. Cash out now! Will Hoskin-Elliot ($419,000 BE 83) may be another cash out now prospect. It’s no secret that his fantasy game suffers greatly in the wet, practically halving each time to 50. With a BE of 83 this week and rain on the radar it’s looking very likely that WHE will lose more cash this week. He’s already made you $189K so take the money and run if you can. We have a few rookies possibly heading to China this week and the fear of the unknown is strong here. With weather reports seeming like they’ll be playing in a post-apocolyptic wasteland, who knows how this will effect scoring? Add into the equation that they have a bye following this game, my instinct is to fall on the side of caution and trade out my fattened up Port and Suns rookies now. Dan Houston ($349,000 BE 67) and Sam Powell-Pepper ($332,000 BE 49) are absolutely ripe for the picking to cash out and use their cash elsewhere. Brett Eddy ($179,000 BE 13) and Aidyn Johnson ($168,000 BE -1) are in a different barrel though. Eddy has kicked a few bags in the SANFL the last few weeks and could prove handy. If he’s named and you still have him there is cash to be made. If he’s named and you don’t have him then perhaps a downgrade to him this week could be a plan to free up cash elsewhere. Keep in mind though, playing in a sandstorm might prove difficult for a marking forward so you may not want to risk him on your field. 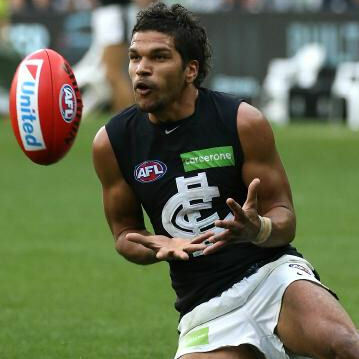 While Johnson could earn a recall if Port decide to spare any of their stars from the flight. Over at the Suns, you may want to consider Brad Scheer ($157,000 BE 14) this week if you need a downgrade in your midfield. While his score wasn’t great he certainly did enough to hold his spot for a week at least. As mentioned with Jake Barrett, one of the Lion cubs pushing for selection is Josh Clayton ($150,000 MID). It’s his 3rd year at the club and he was named as an emergency last week. If you’re desperate for a downgrade mid he could be an answer if named but I’d only be going there as a last resort. He didn’t exactly set the world on fire last year with scores of 28 and 37. The watchlist for downgrades needs to include Luke Ryan ($150,000 DEF), Matthew Scharenberg ($234,000 DEF), Harry Perryman (DEF/MID. $224,000), Daniel Lloyd (FWD $150,000), Hugh Greenwood ($150,000 MID/FWD) and Nathan Freeman ($150,000 MID). While Freeman and Ryan still may be a few weeks away, Scharenberg, Perryman and Lloyd are ready to go and and instant downgrades if named. Greenwood may still need to be upgraded so keep an eye on that. Meanwhile Nic Newman seems to be the new Tom Mitchell. Absolutely killing it at NEAFL level adding another 30 touches and a goal to his stat sheet but inexplicably left out of the senior side. Looks like Horse has found his new whipping boy! Here’s a few questions tweeted in yesterday! However if ANB misses out again then move him to the top of the list. In all seriousness he showed more last week, was composed with ball in hand and definitely did enough to hold his place. The concern is where Simpsons priorities lie with challenging vs building. Hutchings also played well enough to hold his spot this week but one will miss to make room for Duggan. Unfortunately unless he does something incredibly special he’ll be a fringe player this year. Add to this the news yesterday that Cripps is ahead of schedule for a return from injury and Mutimers JS gets a 2-3 week deadline. Black is still great value if you didn’t grab him. Mutimer is a chance if you’re desperate but has an expiry date as mentioned above, McNiece is still well priced if he comes back otherwise pay the extra and grab Hardwick. Butler, WHE still has potential to score well. Oh man, we’d love him to come in soon but after an injury recently he’s only just finding his feet at WAFL level again. Promising signs last week though so fingers crossed he could be good cover during the byes. I think so. Based on his past average where he’s shown us that he can average 80 a season with a 100 as a ceiling, we’ve gotta hope it was just a slow burn to get use to AFL again. Considering he’s in their best 22 though you’ve just got to take the chance on him. Thanks for the tweets and for reading! Best of luck with your rooks this week and I’ll hope to catch a heap of you at #DTTALKinPERTH! Feel free to tweet me on @Anthonydsmith86 with any other questions! Hampton to Scharenberg a decent option? What’s Scharenberg JS and scoring potential like? I’m considering the same but if a cheaper option were to debut this week I’d probably go there…can see more worth in using the extra 80k on upgrading to ubers over the next 3 weeks and money is hard to find this year. Definitely aim for a cheaper option if named. Fingers crossed for McNiece. Thanks for the research Anthony. Missed one winner in Matty Kennedy. Is his JS decent with a few outs the giants are having? I’ll be honest, Matty Kennedy is in my personal side and his 90 was very much appreciated! With a BE of like 16 this week he’ll certainly be held for a few more weeks for me! What about Lloyd of the Giants? Yeah cracking the side is the issue, he’s been a very strong performer in the 2’s so no doubt he’ll get a shot soon but whether he’ll be given a decent run of games is the concern. What’s better Hampton and WHE to Myers and Neale or SPP and Hampton to Myers and Heeney/Franklin? Currently done WHE and holding SPP on more week as he has an attainable BE of 49. Do u have a source on that? Neale has been tracking a lot better and Pav also mentioned that he played the first few rounds injured but is good now. I’d strenthen whichever line is currently weakest. if you only have 2 or 3 fwd keepers I’d bring in Farnklin. If you have 4 or less premo mids, look to bring in another. Currently have 5 premo Mids Danger, Rock, Zerrett, Treloar and Fyfe. With Macrae,Dahl, Steele and Rough in fwd line with WHE and Balic. But I’ll move Barrett in there to get Murphy. ok I’d get a mid. Martin if you can afford. Or fallen Hanners or Steven if you think they’ve turned the corner. After the way Horse has been treating Newman i’m honestly terrified to have anymore Sydney rookies in my team. It’s better having playing rookies than players sitting on your pine doing nothing. For people like myself who went the guns n rookies structure you have to turnover rookies quite constantly to get cash….. I had my 1st upgrade last week and I’m still ranked 2671. Worth noting on Myers, he was played purely as a defender against Fremantle, a position he has continually failed miserably at in the past. Seemed like Woosha was experimenting with a few positional changes in that game. His VFL form was based on playing as an inside mid so I would recommend waiting at least another week to see his role once a few players come back in. I plan to apply most of that watchlist over the bye round, have a feeling it will be slim pickings for bench coverage for a lot of teams after the byes. AFL coaches should be forced to bleed rookies into the senior teams over the bye rounds. Gil, I know you’re watching, make it happen. I’m thinking Out – ANB & Parfitt. In – Melican and one of Yeo/Neale/Franklin (leaning to Yeo). What do you think? Yup never thought I’d be saying this at the start of the season but Yeo looks the way to go…he has been looking awesome. Neale back though thank god as I’ve had him from the start of the season..Really think it’s whoever fits your structure better cause they are all good picks…am guessing end 12 bye of Yeo would be appealing as well. CHeers mate, gotta add Houston to that section now too! Keep WHE another week if so! =Thanks for the article Anto. In this particular case I would put Houston just above WHE because it gives you more cash to play with and the Port dude’s average is just above his BE, but the Collywobbles bloke has an average below his BE. That’s generally how I roll. So I did the unthinkable and didn’t start with Rocky. Only way I can bring him in this week is by bringing a 150k rook in (aka Luke Ryan). Is it worth hoping he gets named in a few weeks or just doing something else this week, want to delete me team after I see how much Rocky scores and then bring him in the week after. Luke Ryan unfortunately hasn’t been doing enough, consistently enough to earn his spot yet so it may be a longer wait than we’d like on him. Honestly if he’s not still sitting in your team then I’d be tempted to get Hibberd in to sit in that spot. At least he’s a DPP for movement purposes and he’s a chance to come back eventually. Cheers mate. Great alternative. Don’t need them to even be an emergency anyways. Cheers for the top work. No one talking about Himmelburg? His JS at the giants has surely gone up a notch with more injuries to their Defenders. Houston has shot up to number 1 with the news he’s out now. Original reasoning for having SPP higher is if you have to play either on field I was more comfortable taking Houston’s score than SPP’s but it honestly wasn’t by much. If you could trade both out this week I would. shaw or docherty ? its a tough call given shaw is so cheap. Hampton to Shaw is a bloody great option if you’re convinced Shaw is a keeper this year. Otherwise bank to cash to use on a premo elsewhere. Shaw is so tempting for Hampton! Thanks Maggie! Giant shoes to fill though so hoping Jep is back soon! who would be a good cheap option to get in for hampton and play on field ? Scharenberg has been on the radar longer than the imperial russians – will he play, is he good, and whats his likely average and JS. thoughts anyone ? You’d think with how Collingwood are travelling he’d be a decent chance soon. But yeah his scoring could be a concern if Collingwood refuse to try to move the ball from their halfback line. They seem scared to recently. Scharenberg is a good ball user though so fingers crossed they give him a shot and he shows something! Hampton + WHE to Hardwick and Yeo via dpp. Hardwick looks like a consistent 60 and a good cash cow to trade out at the round 13 bye. I’ll wait a week on Myers and other rookies that pop up this week. Myers is best 22 IF Woosha uses him in the midfield. As a defender his scoring and JS gets a lot shakier. That is a decent trade though! Need help with trades this week. Have 269k the bank! Suggestions please! Any suggestions for trades above? Liam, Heeney or Yeo should be okay, good luck. Who should I trade out to get heeney in? Jeez put on your big boy pants and have a go yourself! Cheers Anthony! A great help. I was looking at trading out WHE and Hampton, very happy when the experts agree! The podcast fingered Jeremy finlayson. Anyone know any more on where he is at? Anybody looking at J Sinclair from Saints? Of the following three players, which two would you field? – Taranto, Balic and Myers? I have hampton, ANB, WHE, Houston and Butler still. Which 2 are priority to trade out this week. If i trade out ANB and WHE i can manage to bring in rocky, otherwise for the others titch will most likely be the in (or k simpson). I have those 5 too, I’m thinking WHE needs to go this week and probably Hampton, I’m concerned they will both lose cash. Houston can stay this week as he can’t lose anything, ANB is worth one more go I reckon, Butler should make his BE and has good JS. Titch is still a must have so not a bad 2nd option to Rocky. I think ANB, I have all you mentioned besides Houston, and at this stage im leaning toward ANB as gonski. And we have some fresh meat confirmed!! Mark O’Connor. Defender. Tick. R12 bye. Tick. Doesn’t play for Collingwood. Tick.